Star Wars Themed Droid 2 Launching August 12th? Engadget is reporting that the Droid 2 will be launching on August 12th, 2010. According to their source, the sequel to the original Droid will not only come with Froyo at launch, but have an optional R2-D2 special edition logo on the back. It appears the Droid line is going back to its Star Wars roots. After all, Verizon and Motorola had to license the name Droid from Lucas Films in order to use it for their Android-packing devices. Honestly, I am hoping for a light saber too! Readers should remember that the August 12th date might change, as nothing is set in stone. More on this story as it develops folks. Oh and may the DROID be with you! What do you think? 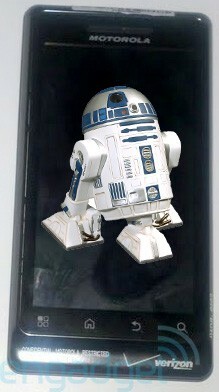 Would you want R2 on your Droid 2?